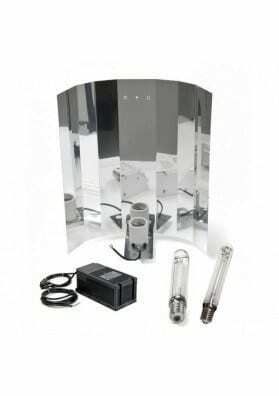 This Cheap Cooltube Grow Kit includes a ballast, a Cooltube-type reflector to refresh the lamp, a cable, a lamp coming from the most economic brands. 250W, 400W or 600W of power. - Safety ambivalent ETL (Ballast) of 250W, 400W or 600W. - Wire with injected plug. - Agrolite lamp or Sodium-like lamp. 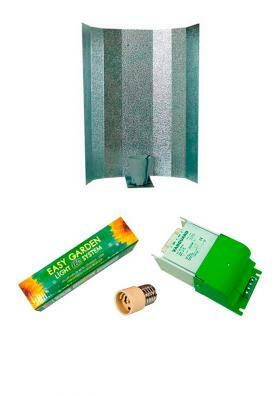 Since the Cooltube-type reflector permits to cool directly the lamp away from the plants, the same lamp can be placed closer to the plants thus improving the use of the emitted lumens. The grow kits are delivered as mounted as possible. However and considering that these grow kits sometimes have distinct configurations you will need to make some type of connection when you receive it, but always in a simple way of doing it.